Heathrow is located in 12 NM west of central London, near the southern end of the London Borough of Hillingdon. The airport stands on a parcel of land that was designated part of the London Metropolitan Green Belt. To the north, the airport is surrounded by the built-up areas of Harlington, Harmondsworth, Longford and Cranford. To the east are Hounslow and Hatton, and to the south are East Bedfont and Stanwell. To the west, the M25 motorway separates the airport from Colnbrook in Berkshire. The airport's location to the west of London, and the east-west orientation of its runways, means that airliners usually approach to land directly over the city. Other leading European airports, such as those at Madrid, Frankfurt and Paris, are located north or south of their cities, to minimise the overflying problem. Another disadvantage of the site is that it is low-lying, at 83 feet (25 m) above sea level, and can be prone to fog. Heathrow is one of seven airports serving the London area, along with Biggin Hill, Gatwick, Stansted, Luton, Southend and City although only Heathrow, Biggin Hill and City Airports are located within Greater London. 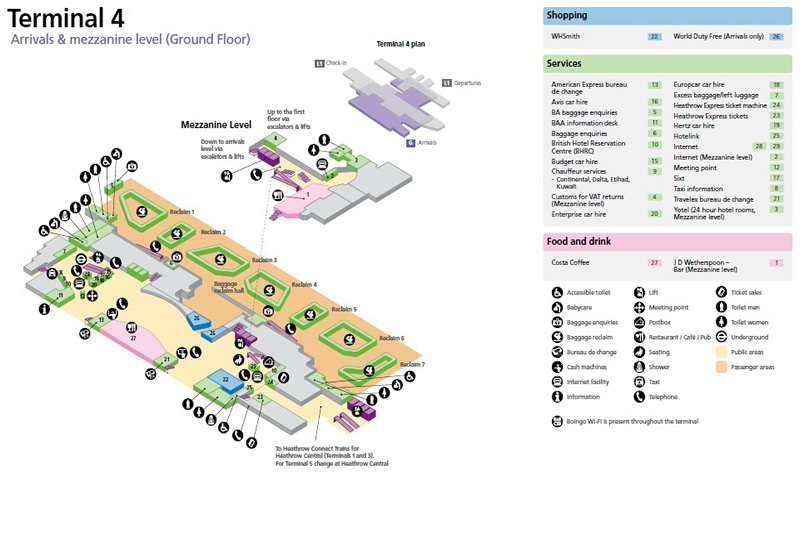 Heathrow Airport is used by over 90 airlines which fly to 170 destinations worldwide. The airport is the primary hub of BMI, British Airways and Virgin Atlantic Airways. Terminal 1 was opened in 1968 and was formally opened by Queen Elizabeth II in May 1969. In 2005, a substantial redesign and redevelopment of the terminal was completed, which saw the opening of the new Eastern Extension, doubling the departure lounge in size and creating additional seating and retail space. The terminal has an area of 74,601m2. It is home to Heathrow's second largest carrier, bmi, and airlines belonging to the Star Alliance. 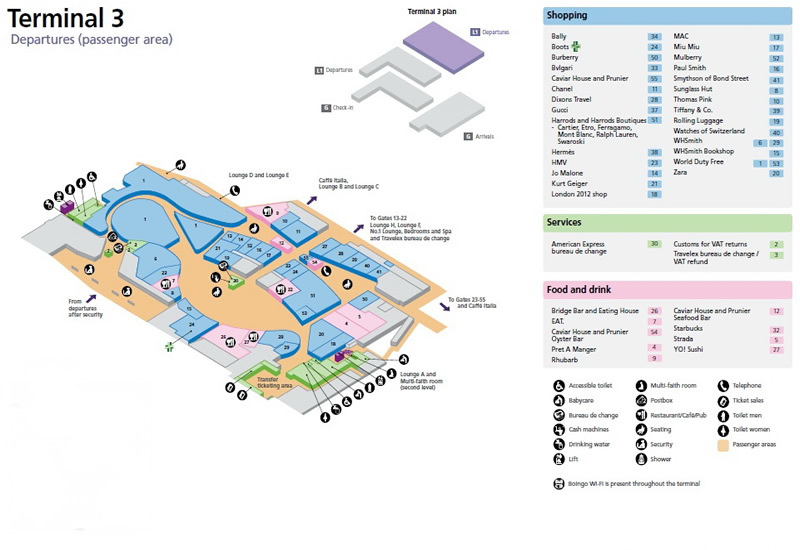 It is set to be closed and demolished around 2013/14 to enable the construction of the second phase of the new Terminal 2, scheduled for completion in 2019. Terminal 3 was opened as The Oceanic Terminal on 13 November 1961 to handle flight departures for long-haul routes. At this time the airport had a direct helicopter service to Central London from the gardens on the roof of the terminal building. The Oceanic Terminal was renamed as Terminal 3 in 1968 and was expanded in 1970 with the addition of an arrivals building. Other facilities were also added, including the UK's first moving walkways. In 2006, the new £105 million Pier 6 was completed in order to accommodate the Airbus A380 superjumbo; Singapore Airlines, Emirates and Qantas now operate regular flights from Terminal 3 using the Airbus A380. 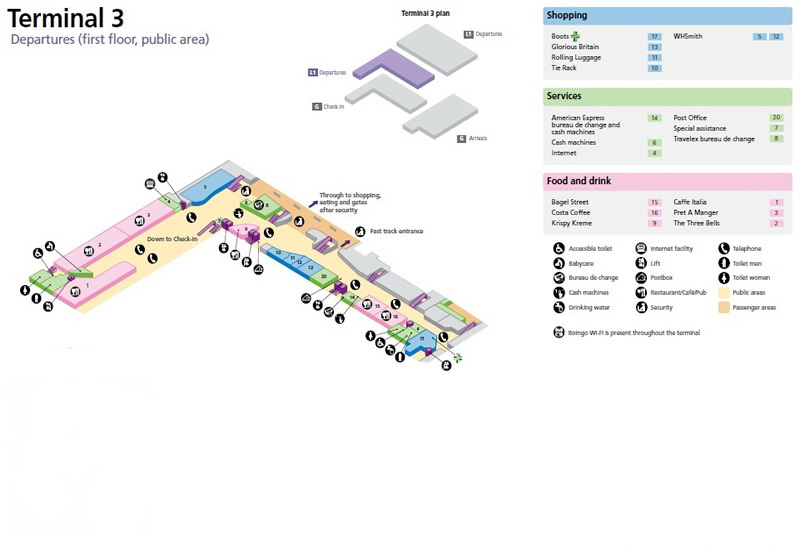 Terminal 3 has an area of 98, 962m2. 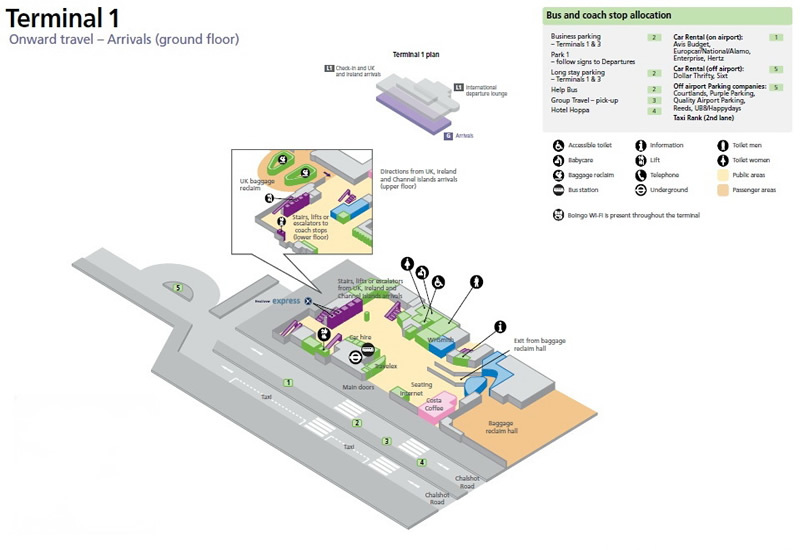 Redevelopment of Terminal 3's forecourt by the addition of a new four lane drop-off area and a large pedestrianised plaza, complete with canopy to the front of the terminal building was completed in 2007; these improvements were intended to improve passengers' experiences, reduce traffic congestion and improve security. 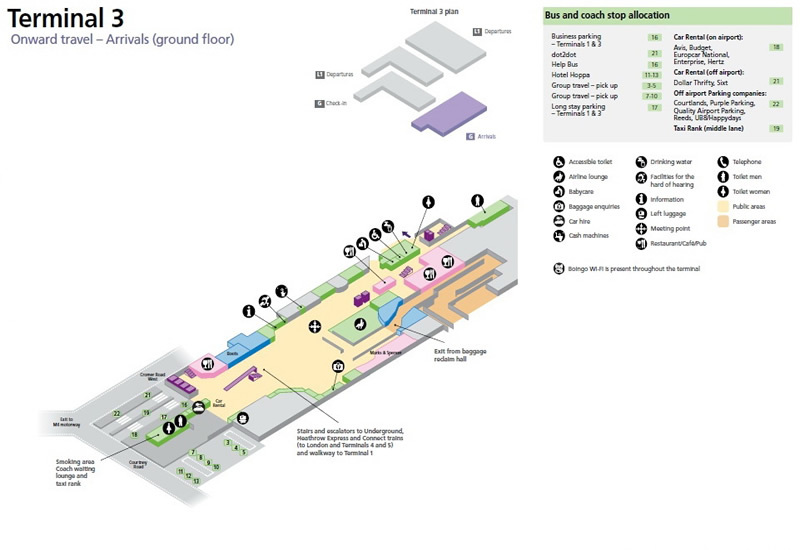 As part of this project, Virgin Atlantic were assigned their own dedicated check-in area, known as 'Zone A', which features a large sculpture and atrium. BAA also have plans for a £1bn upgrade of the rest of the terminal over the next ten years which includes the renovation of aircraft piers and the arrivals forecourt. 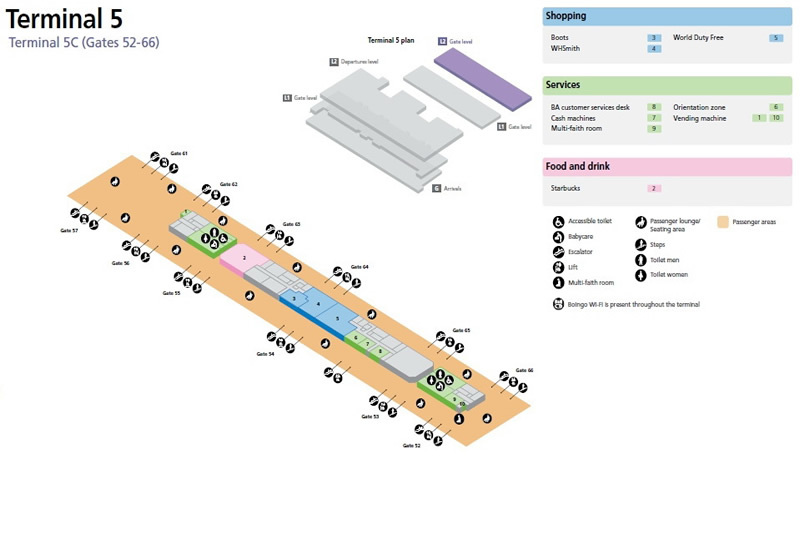 A new baggage system which connects to Terminal 5 (for British Airways connections) is currently under construction. 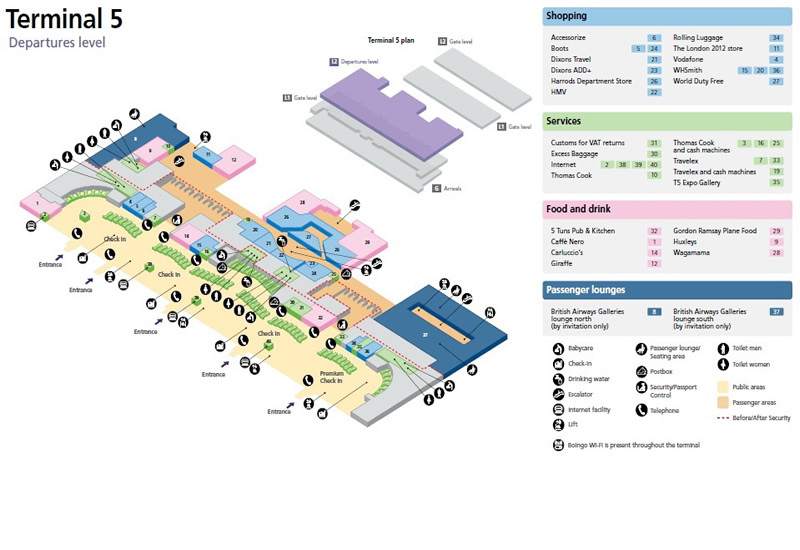 In addition to the baggage system, the baggage claim hall is also set to undergo changes with dedicated A380 belts and hope of improving design and layout of the area. 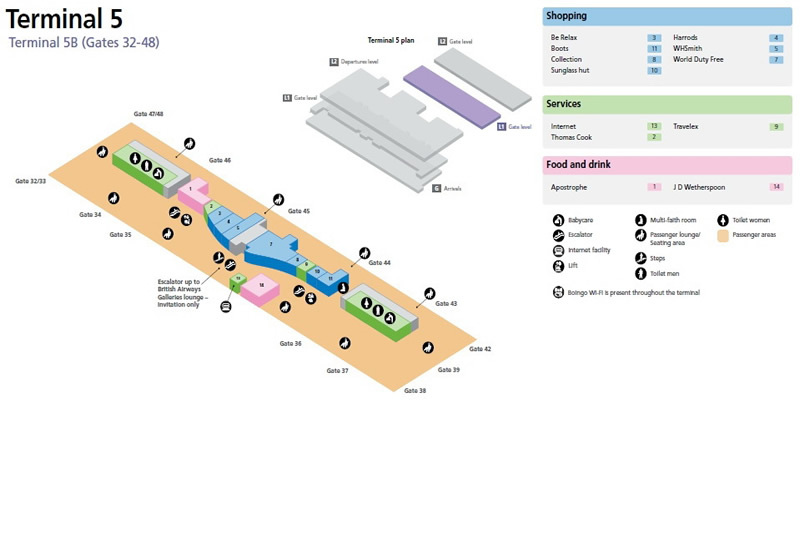 First opened in 1986, Terminal 4 is situated to the south of the southern runway next to the cargo terminal, and is connected to Terminals 1, 2 and 3 by the Heathrow Cargo Tunnel. The terminal has an area of 105,481m2. Now home to the SkyTeam alliance as well as some unaffiliated carriers, it has recently undergone a £200m upgrade to enable it to accommodate 45 airlines. The forecourt has been upgraded to reduce traffic congestion and improve security. 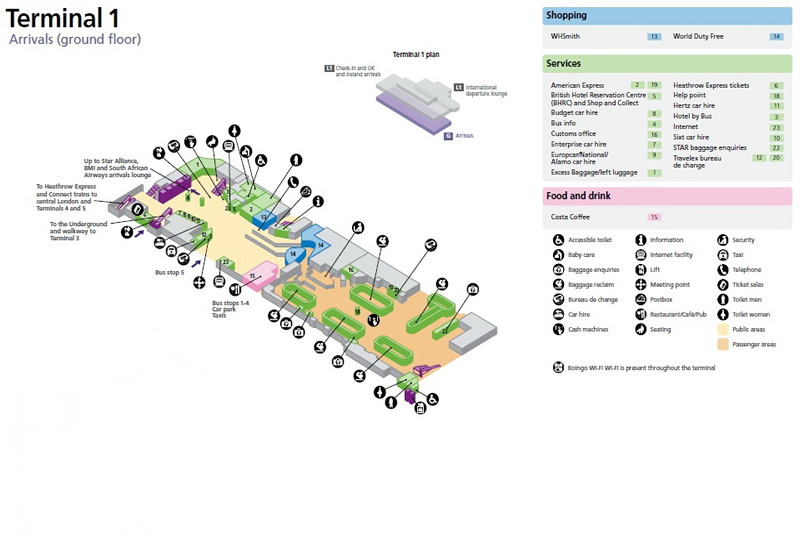 An extended check-in area and renovated piers and departure lounges have been delivered, two new stands to accommodate the Airbus A380 have been constructed, and a new baggage system has been installed. Terminal 5 is situated between the northern and southern runways at the western end of the Heathrow site, and was opened by Queen Elizabeth II on 14 March 2008, some nineteen years after its inception. It opened for passenger use on 27 March 2008. The first passenger to enter Terminal 5 was Paul Walker, a UK ex-pat from Kenya who entered through security at 04:30 on 27 March 2008 and was presented with a boarding pass by the British Airways CEO Willie Walsh for the first departing flight, BA302 to Paris. The first two weeks of the terminal's operation were disrupted by a number of problems with the terminal's IT systems, coupled with insufficient testing and staff training, which caused over 500 flights to be cancelled. 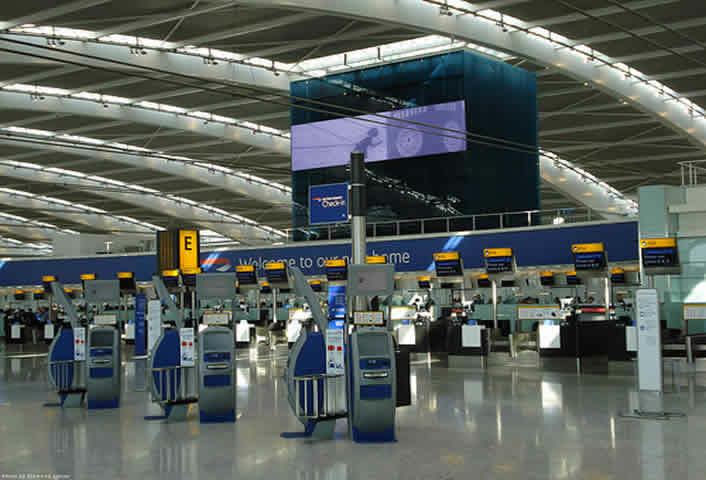 Terminal 5 is exclusively used by British Airways as their global hub. Built at a cost of £4.3 billion, the new terminal consists of a four storey main terminal building (Concourse A) and two satellite buildings linked to the main terminal by an underground people mover transit system. The first satellite (Concourse B) includes dedicated aircraft stands for the Airbus A380; Concourse C is currently under construction and scheduled to open in early 2011. 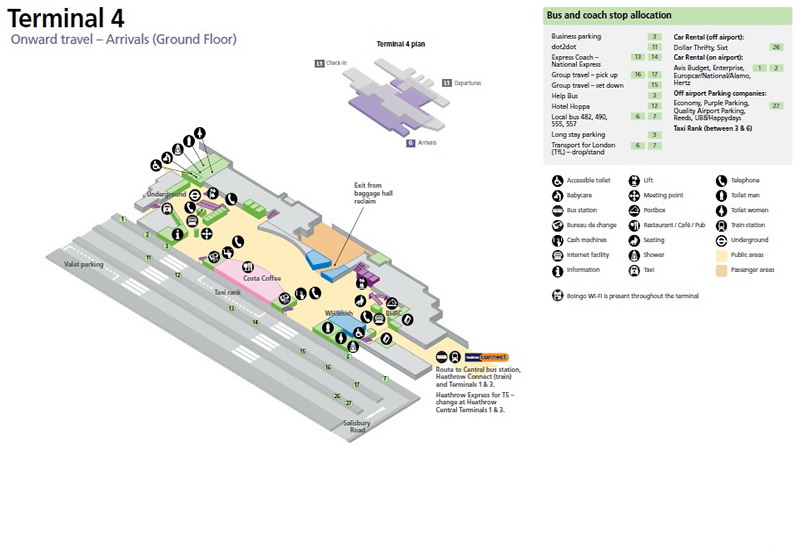 Terminal 5 has an area of 353,020m2 (Concourses A and B combined). It has 60 aircraft stands and capacity for 30 million passengers annually. There are more than 100 shops and restaurants. A further building, similar in size to Concourse C, may yet be constructed to the East of the existing site, providing another 16 stands. This is likely to become a priority if British Airways' merger with Iberia proceeds, since both airlines will want to be accommodated at Heathrow under one roof in order to maximise the cost savings that the merger envisages. BAA claim that Heathrow is the "world's busiest international airport", but it is only the world's second-busiest by total passenger traffic, after Atlanta-Hartsfield-Jackson, which is also an international airport. However, Heathrow does have the highest number of international passengers. Heathrow Express: a non-stop service directly to London's Paddington station; trains leave every 15 minutes for the 15 minute journey, either from Heathrow Terminal 5 station or Heathrow Central station (Terminals 1, 2, 3). Heathrow Connect: a service to Paddington calling at up to five National Rail stations en route - trains leave every 30 minutes for the 25-minute journey. 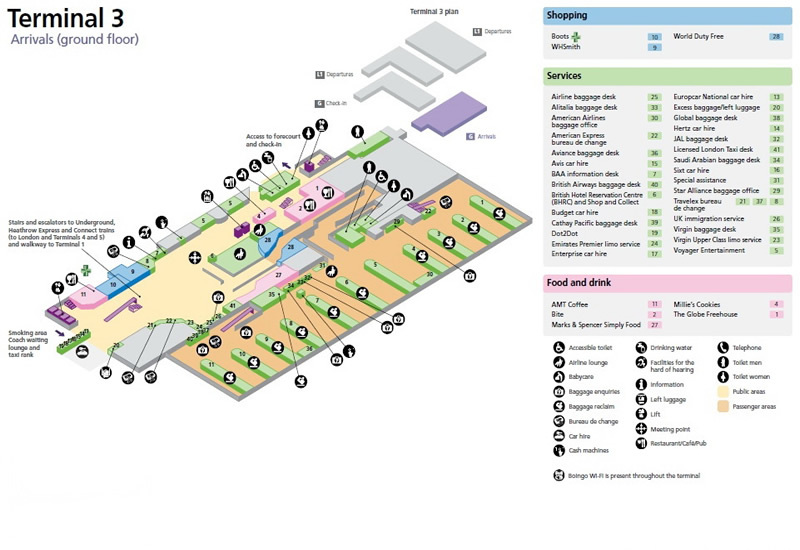 Heathrow Connect services use Heathrow Central station (Terminals 1, 2, 3) and terminate at Terminal 4. 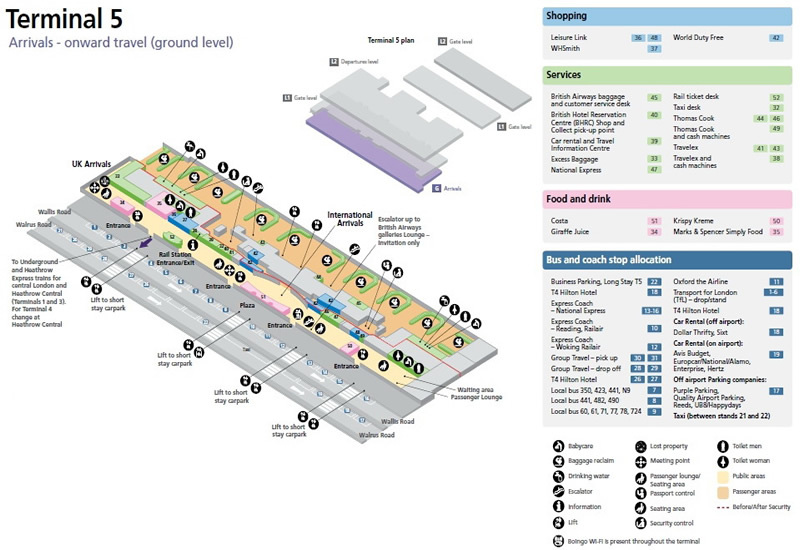 London Underground Piccadilly line: four tube stations serve the airport - Terminals 1, 2, 3; Terminal 4; Terminal 5 serve the passenger terminals, and Hatton Cross serves the maintenance areas. The standard journey time from the Heathrow Terminals 1, 2, 3 tube station to Central London is 40–50 minutes. Between 1981 and 2004 the airport was linked to central London by a group of routes known as Airbus. These routes carried A prefixes before their numbers; one route, A10, operates with such a number to Uxbridge. 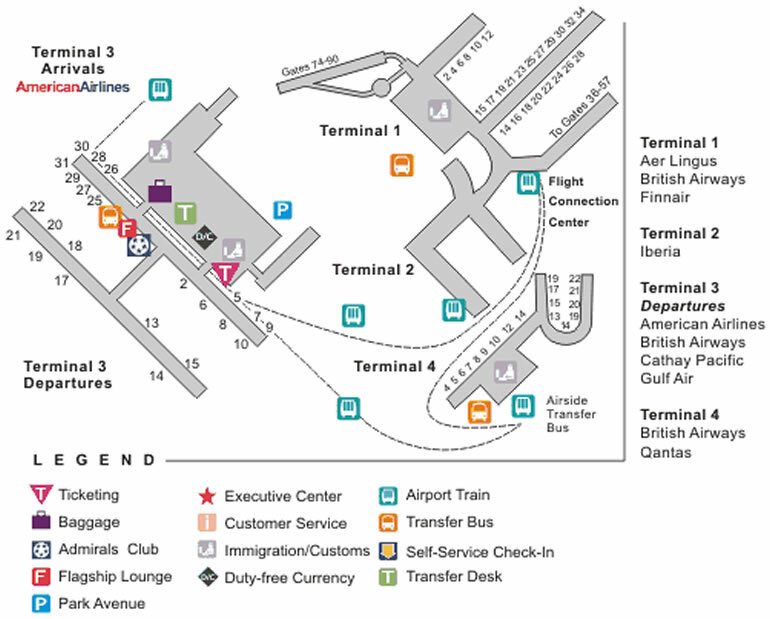 Terminals 1, 2 and 3 are within walking distance of each other. 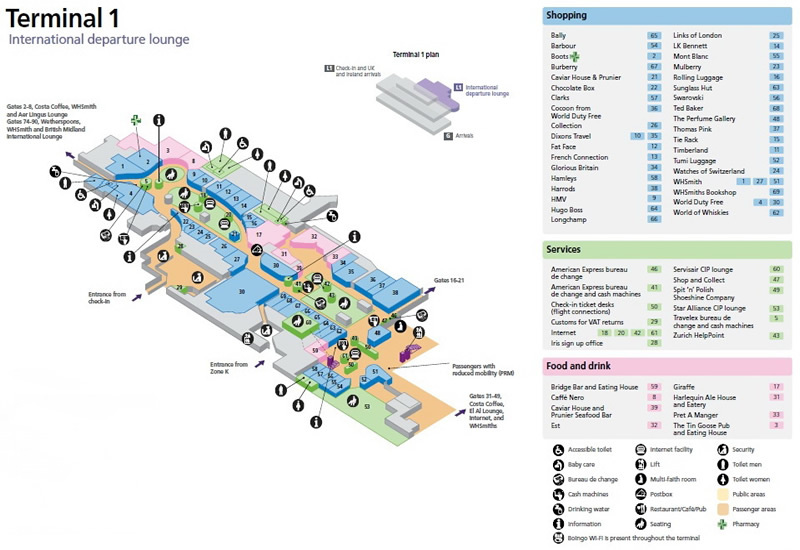 Transport to Terminal 4 is by Heathrow Connect trains or bus and to Terminal 5 is by Heathrow Express trains or bus. 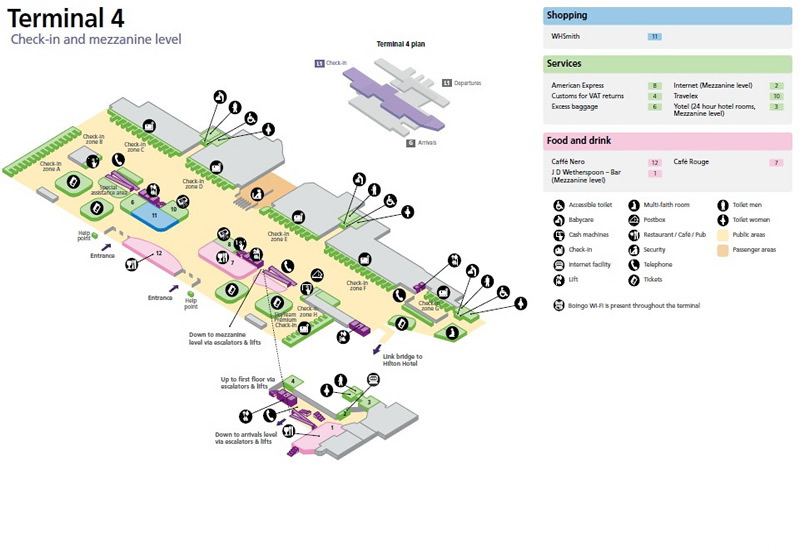 On Heathrow Express, Heathrow Connect and local buses (but not on the London Underground) the sections between Heathrow Central, Terminal 4 and Terminal 5 are free of charge. ULTra Personal Rapid Transport is currently being constructed as a trial shuttling passengers to and from Terminal 5. The initial trial will have 18 pods running. ULTra are small transportation pods that can fit four adults, two children, and their luggage and will be able to carry passengers directly to the terminal. The pods are battery powered and will be initially used on a four kilometre track. If the trial is successful there are plans for a roll out airport wide. 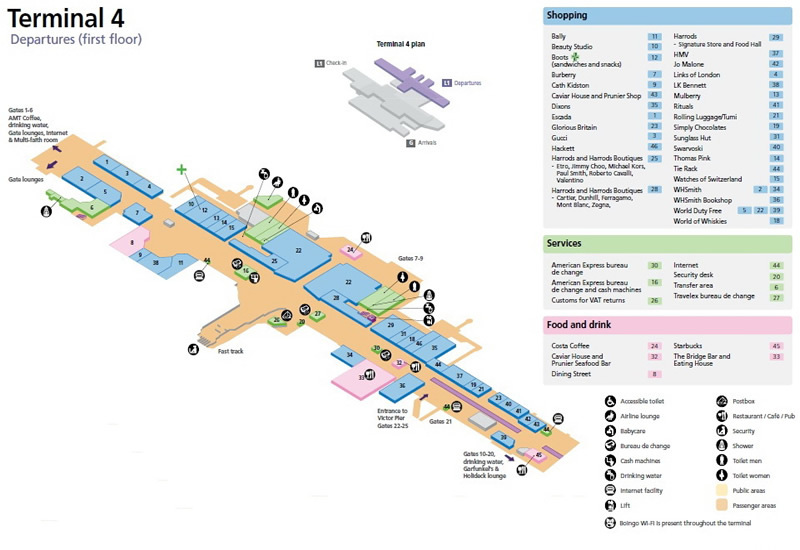 Heathrow is accessible via the nearby M4 motorway and A4 road (Terminals 1–3), the M25 motorway (Terminals 4 and 5), and the A30 road (Terminal 4). 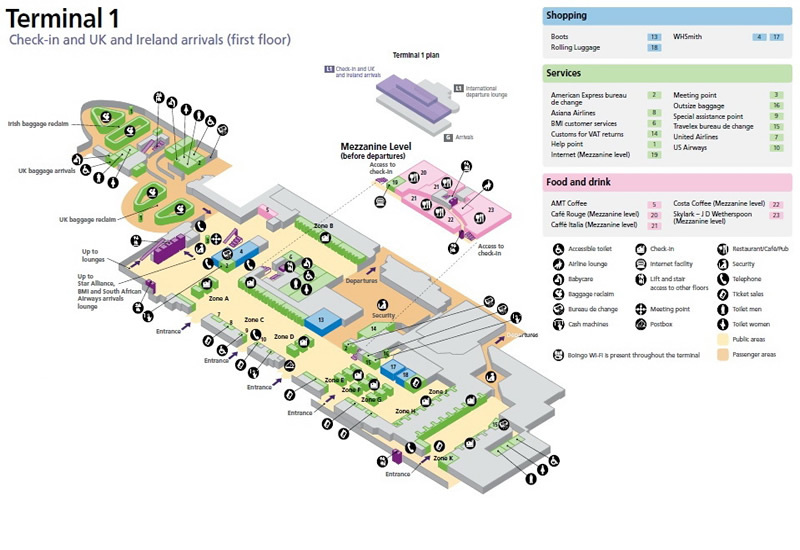 There are drop off and pick up areas at all terminals and short and long stay multi-storey car parks. 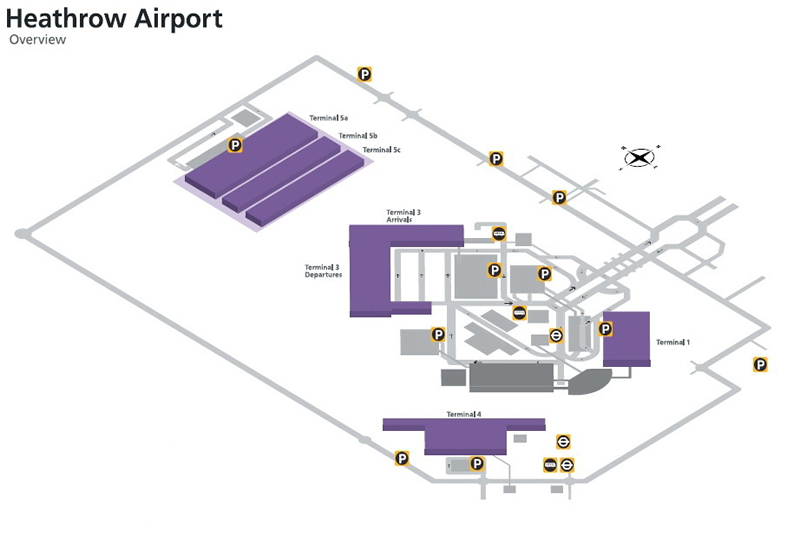 Additionally, there are car parks (not run by BAA) just outside the airport; these are connected to the terminals by shuttle buses. Four parallel tunnels under one of the runways connect the M4 motorway and the A4 road to Terminals 1–3. The two larger tunnels are each two lanes wide and are used for motorised traffic. The two smaller tunnels were originally reserved for pedestrians and bicycles; to increase traffic capacity the cycle lanes have been modified to each take a single lane of cars, although bicycles still have priority over cars. Pedestrian access to the smaller tunnels has been discontinued, with the free bus services being the alternative. There are (mainly off-road) bicycle routes to some of the terminals. 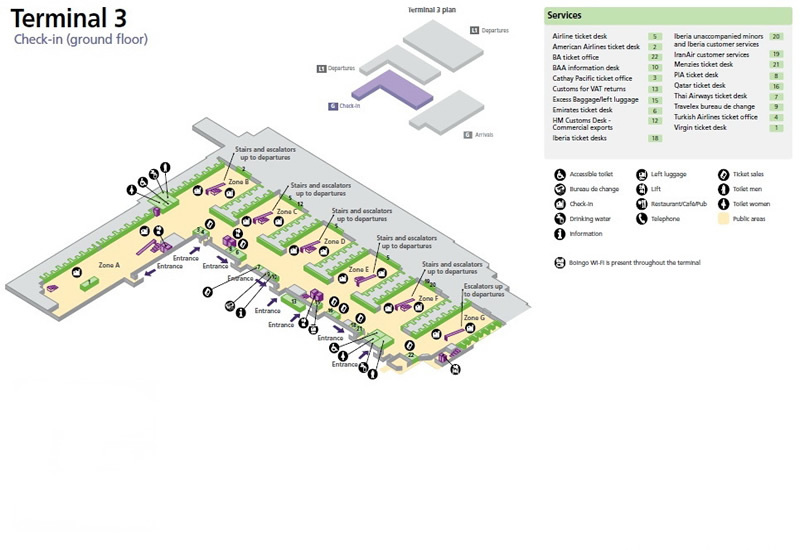 Free bicycle parking places are available in car parks 1 and 1A, at Terminal 4, and to the North and South of Terminal 5's Interchange Plaza.